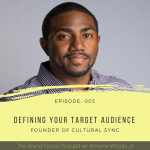 In this episode of the Brand Focus Podcast, we provide insight into the elements of your brand core. Discussing the importance & impact of defining your brand core which consists of your vision statement, mission statement and core values. We review each element individually and provide a breakdown and examples of each.